Two of my favourite people came to visit today, under the pretense of wanting to watch me bake. Really, they came to nap, watch telly with my siblings, and eat whatever I baked while they did the above. I love them anyway though, and perhaps a little bit more now as they made the effort to trek all the way over to where I live safely ensconced in the suburbs. I’ve been thinking of what to make while they were here all week; banana butterscotch cake, chocolate cake, chocolate chip cookies, or mille crepe cake? I’ve wanted to try my hand at a mille crepe cake since Jessica first had me try one years ago, but have always been a bit put off by what I thought was the difficulty of making crepes. Pfffffttt. Once I found the perfect recipe (ie easy), it all comes down to testing the consistency and my own ability to swirl and flip a crepe in the pan. Let’s just get on with the recipe, and trust me, you don’t need a fancy crepe pan and spreader (though I imagine it would definitely make perfect crepes). I just used a regular frying pan (not even sure if it’s non-stick), and a silicone spatula. Just flip as you would a normal pancake. In a large bowl, sift the flour, cocoa powder, salt, and sugar, then make a well in the middle to pour in the eggs, vanilla, milk, honey, and butter. Whisk the mixture together by hand, or with your electric stand mixer if you have one. Leave the batter to rest for 30 minutes, then heat your pan, drop a smidge of butter on and use a ladle to scoop up the batter for the crepe. I used around 1/4 cup of the batter for each crepe. Swirl the pan to get the batter all around the pan, leave for 1-2 minutes, then flip over and cook for another 1 minute. Remove to a cooling rack, where you have to let the crepes cool completely before you stack them. I find that it takes the duration to make 2 crepes for 1 to cool completely. Anyway, I’m sure you’re smart enough to figure this out on your own. 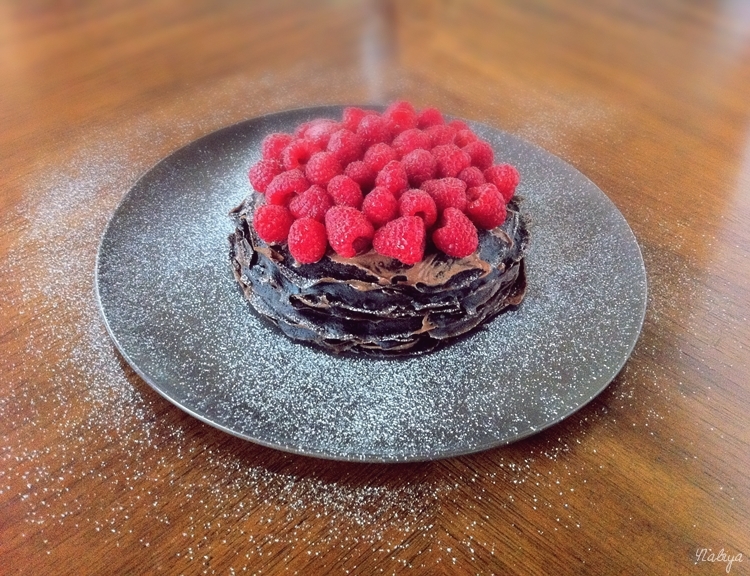 I then used leftover chocolate sour cream frosting from this cake to spread in between each crepe. You can use whipped cream (200ml whipping cream, 1 tsp vanilla, 1/4 cup icing sugar, whisk until soft peaks form), drizzled with chocolate sauce (100g choc, 15g butter, 1 1/2 tbsp honey, 70ml milk, whisked together in a bain marie) instead. Then I topped the entire thing with fresh raspberries, and sifted confectioners sugar over the lot. Cover and chill the cake for an hour in the fridge before serving. Or whatever, eat it right then and there, as we did. Previous Post Happy Holiday Cake!